Sahara Douz is classified as 4 star establishement located at the edge of the palm grove of douz with its authentic architecture and its decor is considered a wonderful place to relax, its was built in 1990 and was renovated in 2008. The hotel is built amidst a lush oasis of 300 palm trees. Whether you are by yourself or with your families you will find in this place all the comfort and privacy that will make your journey more enjoyable. Hotel provides you with the opportunity to enjoy the fascinating beauty of the sunrise and sunset on the endless of the horizon. The staff that is in charge of providing all services in hotel is highly qualified and also known for this remarkable dexterity. Hotel offers a restaurants serving delicious international and local cuisine. The restaurant is non smokers, breakfast, lunch and dinner are served in buffet style. 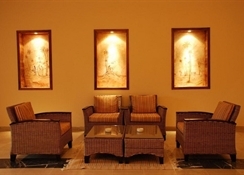 The hotel is also endowed with a lounge bar, pool bar and moorish cafe where the scenery is guaranteed. Residents of the Sahara Douz are provided with different recreational and entertaining places, you can enjoy the pleasure of fresh water of the outdoor pool and the thermal water in the indoor pool, they are also provided with the area of sporting activities including quad, aircraft ultralight motorized and a ranch that offers more enjoyment and pleasure in accordance with the beautiful ambiance of the natural sahara landscape. 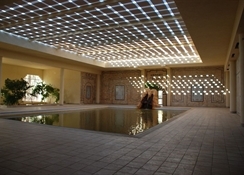 In this hotel clients are provided with spa, beauty & relaxation equipments, it offers health fitness treatment inspired from the ancestral tradition of moorish baths and eastern rites of relaxation and well being. For your meetings, hotel offers a conference room accomodating up to 120 people, it's well equipped to host all your events with audio visual, computer, screen and microphone. 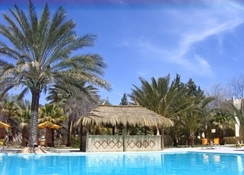 The hotel is ideally located at the edge of a palm grove of Douz and at the foot of the great dunes of the sahara. It's away only 3 km from the town center, 120 km away from the international airport of Tozeur, 100 km away from the famous Matmata with its troglodyte dwellings and about 150 km away from Ksar Guilane. The hotel consists of 155 rooms which have been recently renovated, they are distributed around the shady gardens and offering services and amenities suitable for both travelers in search of discovery and adventure or guests looking for relaxation and idleness. The balconies or windows have views on the pool, sand dunes or on the immense palm groves of Douz. 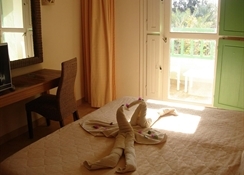 Rooms are well decorated and equipped with the necessary conveniences for a nice stay including air-conditioning or heating, telephone, hairdryer, bathroom, bathtub or shower, tv set, rooms for disabled people are available. 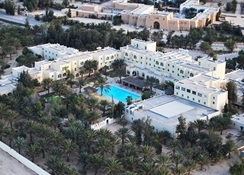 The nearest airport to hotel is the international one Of Tozeur which is away about 120km with an approximate driving time of Half and an hour. The means of transports are available to go any where including bus, jeep and also taxis.